The dance floor sets the tone for your event and ties the room together. 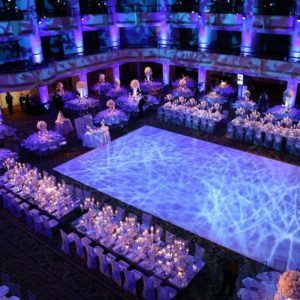 Choosing a dance floor for your event or wedding can make or break the entire event. Keep in mind that the dance floor is also one of the most photographed locations of an event. Have you ever been to an event where the dance floor is too small, or too big. Or the style of the dance floor doesnt match with the light fixtures, flowers, or design of the event? Too often people sacrifice their options for dance floors and choose to use the floor provided by the venue. 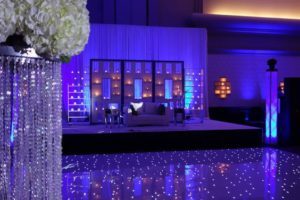 It really is worth selecting a dance floor as an upgraded rental piece, just as you would a charger or other tabletop item. 2.Where will the dance floor go? 3.How big of a dance floor do you need? 4.What style complements your event most? Some people think that the bigger the dance floor the better, however most times, its the opposite. something that will entice the “maybes”. A smaller dance floor gives room for more of an intimate experience. They can interact easier with family and friends, and feel less like they are being put on the spot. One of our current favorite styles are LED dance floors. It is the perfect addition to any party or space and quickly becomes the center of attention. 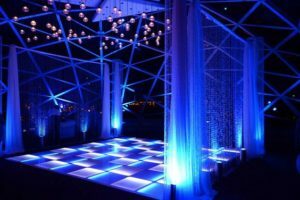 An all white LED dance floor, for example, will tie the room in an elegant and modern way. 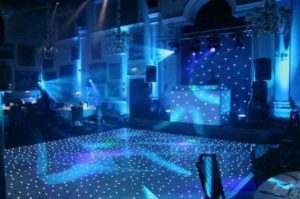 Depending on the space you have available, an LED floor setup can really put your event experience above the rest. High tech LED dance floors can also be be coordinated with the music creating an unforgettable experience.